Marvelous! Wonderful! Extraordinary! Splendid! A true gift to the reader! I am certain I will not properly convey how brilliant this story was, but please just believe me that this book was a true gift to read as the last one for 2012. It was such a special book. 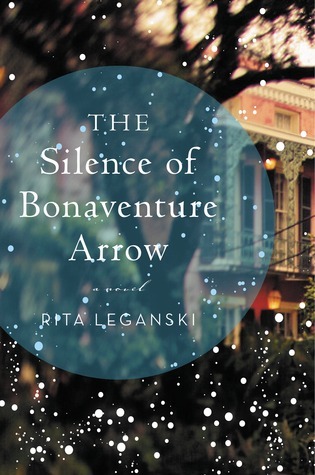 Thank you so very much to HarperCollins and Edelweiss for advancing us a copy of The Silence of Bonaventure Arrow. This absolute brilliant gem is set for release in February 2013. So it’s not so very long away, but you must make sure to look for it! Promise! When I first read the description of this tale, I immediately thought, “doesn’t this sound remarkable”? And oh how remarkable it truly was. The writing, so gorgeous, it just envelopes you in its beauty. “Though they had come together to mourning’s abyss, each looked into the gorge alone.” It truly makes you stop and listen. The sense of Hearing and Listening are profoundly employed throughout this story. It also has ghosts, religion, spirits, mysticism, crazy evangelical preachers speaking in tongues, Hoodoo and Voodoo and everything else awesome! Bonaventure Arrow only experiences his world through sound. His early years are spent communicating only through a series of clicks, facial and hand gestures. It was wonderful to sit back and read about Bonaventure’s impressions of people, just by listening. The sound of his ghostly father is always familiar to Bonaventure, even though he doesn’t see him, has never seen him, he is always comforted by his deep, reassuring voice. His grandmother Roman however, is one person that causes Bonaventure distress and anxiety (and always for good reason! Grandmother Roman is a despicable and self-righteous woman). He is most at comfort laying against his mother’s chest and feeling her throat for the vibrations as she speaks. Bonaventure, we are told, has been placed on this earth to help heal the secrets, and there are aplenty in his family that need to be released, healed and put away forever. The Wanderer: He is anonymous and responsible for the murder of the beloved son, husband and not-yet father, William Arrow. The Wanderer has returned from WWII missing half his face. Unable to properly communicate, he seems to become possessed or preoccupied with a mission that takes him from Michigan to New Orleans in order to kill William. Forever after that he remains as John Doe in an asylum. No one, not even himself, knows or understands what provoked him to shoot and kill William. All is revealed however in the end with great heartbreak. William: ghostly William must take care of three tasks before he can fully move on to Heaven. He enlists the help of Bonaventure as he is one of only two people that know of his presence. Bonaventure is the only one to hear his ghostly father who watches over him. William’s completion of the tasks and his final letting go to move on to Heaven will make you cry. I cried. A lot. The Grandmothers: William’s mother Letice, wracked with guilt over her son’s death and cannot overcome that it must have had something to do with those secrets long kept tucked away in a box. Dancy’s mom Adelaide Roman: a despicable, hateful woman that is just mean-spirited and just one of those characters you love to hate, but also has secrets of her own. She is healed as well, but in a very unique and rightful way. Bonaventure’s mother, Dancy: She is left bereft over William’s death and feels it is entirely her fault as well. As hard as it is for both William and Dancy to let go of one another, it is necessary for total healing. Then there is Trinidad Prefontaine. In the beginning, she is constantly aware of an imp’s presence, her feet itch when she feels him near. She is eventually joined to Bonaventure, and becomes a significant person in his life. Trinidad has been given the gift of sixth sense, or The Knowing. She too will work with Bonaventure to expose and heal the secrets, and is aware of William’s presence in his childhood home, the same in which Letice, Dancy and Bonaventure live. And of course there is Bonaventure. One spectacularly, amazingly special boy with an incredibly special gift. Through Bonaventure you hear, and you listen and it’s simply beautiful. It’s simply astonishing and amazing to read. It is definitely a book I did not want to see come to an end. You will want to relish and lose yourself in this beautifully written tale. Absolutely fan-fabulous-tastic! So many amazing poignant moments that cause you to stop and listen and just close your eyes at how beautifully those moments are written on the page. Slowly and elegantly, the secrets are unveiled and it is up to Bonaventure and with help from Trinidad to interpret, discover and bury them in the past where they belong. What a wonderful wonderful book to close out 2012 with! 5 beautiful stars! Again, make sure you pick this one up when it comes out! It does not disappoint in any way! Bonaventure would come to know that life is not always made of beautiful sounds, that too many sounds make cacophony, and that every voice matters. He would come to understand that there’s a difference between the will of God and the will of man, that the acts of one person affects the lives of others, and that God reaches out when it all goes wrong. This is Rita Leganski’s First novel! Splendid!